Your gums can recede as a result of periodontal disease, smoking, diabetes, trauma, overly aggressive brushing, stress, hormonal imbalances, and other causes. The phrase “long in the tooth” as a way of describing advancing age refers to gum tissue’s tendency to recede over time. Gum recession leaves tooth roots exposed, which can lead to dental sensitivity, decay, and loss. Receding gum tissue also can make your teeth look less attractive when you speak and smile. The term “gum graft” refers to a variety of surgeries that periodontists perform to improve the function and appearance of the tissue surrounding your teeth. Gum grafting includes three basic types of procedures. Periodontists often use connective tissue taken from the roof of the mouth to treat exposed tooth roots. They suture this tissue to the gums over an exposed tooth root. To access connective tissue, they cut a flap into the skin of the palate, and suture the flap closed after they remove the graft. These grafts also use tissue from the roof of the mouth. Instead of cutting a flap to obtain the tissue for the graft, periodontists remove the tissue directly from the palate. This type of graft can enhance thin gums. To treat gum recession that occurs on a tooth that’s next to healthy gum tissue, periodontists can create a gum flap or pedicle, leaving it attached to the blood supply, and move the flap over to cover adjacent gum loss. Because these grafts receive continued blood circulation, they typically succeed—but because they require available gum tissue adjacent to the area of gum recession, they won’t work for everyone. In addition to these three basic types of grafts, periodontists also can treat gum recession using allografts, which consist of donated material obtained from a tissue bank, or xenografts, which use tissue obtained from animals. 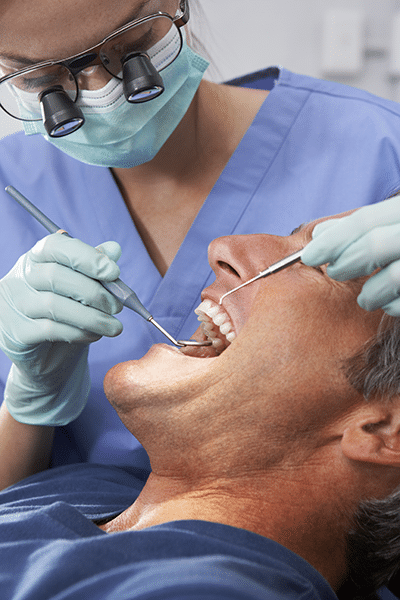 Before gum-grafting surgery, the teeth must be clean above and below the gum line. In most cases, gum surgery requires only local anesthesia. Tiny incisions in the gums create a little pocket for the graft, which is positioned between two layers of tissue. Sutures close the incision after the graft is in place. Post-surgical discomfort varies because no two patients have the same responses to the techniques involved, especially to the process of obtaining self-grafted tissue from the palate. Some patients relate the feeling in the roof of the mouth to the discomfort they feel after eating overly hot food that sticks to the palate and causes a burn. A stent, shaped like a retainer that covers the roof of the mouth, can help protect the donor area from irritation, food residue, and the normal inclination to run the tongue over any area that feels different. After gum-graft surgery, patients receive specific instructions about how, when, and what to eat. The post-surgical diet typically includes liquids and soft foods designed to allow the grafts to heal without exposure to heat, spices, or the need to chew firm or crunchy ingredients. Additionally, patients should stay away from alcohol and tobacco products while they recover. They also need to limit brushing and flossing for a while, take pain medication and antibiotics, and use special oral rinses designed to enhance healing. Once the mouth finishes recuperating, the grafted area blends in with normal gum tissue and looks completely natural.